Grace Hopper was one of the pioneers in the early days of electronic computers. She and her team invented A-0, the world’s first compiler. Then, determined to make programming accessible to more people, she replaced mathematical symbols in programming with everyday English words. Her English-language-based FLOW-MATIC was the bedrock of the 20th century’s most widely used computer language COBOL (Common Business-Oriented Language). Later, as versions of COBOL became incompatible with one another, flouting the language’s founding principles, she introduced a certifier – this was software that examined each version of COBOL and certified whether it could run on all computers and was therefore true COBOL. Grace Brewster Murray was born on December 9, 1906 in New York City, USA. Hopper was her married surname. Her father was Walter Fletcher Murray, an insurance executive; and her mother was the mathematically talented Mary Campbell Van Horne. The couple had three children; Grace was the eldest. Grace grew up in an academic atmosphere – her parents made sure she had access to all the books she wanted, and they did everything they possibly could to support her curious nature. In 1910, her father held her at the window one evening to see Halley’s Comet, which she thought looked bigger than the full moon. He predicted to his three-year-old daughter that she would live to see the comet return 76 years later. Her mother once left seven-year-old Grace unattended, and returned to discover her inquisitive daughter had made a tour of their home, collected seven clocks, and dismantled them all. Grace had started by dismantling just one clock to investigate its mechanism. Then she panicked because she didn’t know how to put it together again. Trying to figure out how to put a clock together, she got another clock, dismantled it… and you can guess the rest! Grace’s father raised his daughters and his son to value education, self-reliance, and hard work; and he urged them to always pursue their dreams. Grace’s favorite activity was reading: she learned passages from Rudyard Kipling’s Just So stories by heart, and shared Rachel Carson’s love of the St. Nicholas magazine. Grace was educated privately at two conservative Presbyterian girls’ schools in New York: The Graham School, from 1912 to 1916; and Miss Mary Schoonmaker’s School, from 1916 to 1923. In 1923, age 16, she spent a year at Hartridge School, a strictly-run boarding school in New Jersey. In 1924, Grace matriculated at Vassar College, a private liberal arts college in Poughkeepsie, New York. Her mother was delighted when Grace went to college – she would have loved to have done this in her own youth, but opportunities for girls were more limited then. Age 17, Grace had already decided to major in mathematics. Her professors noticed she was unusually skilled at explaining difficult concepts in math and physics to other students. Grace graduated in 1928, age 21, with a Bachelor of Arts degree in mathematics and physics. Grace enjoyed academia and won a Vassar scholarship for further study. In 1928, her scholarship took her to graduate school at Yale University in New Haven, Connecticut. The newly married couple sailed with Grace’s family on an eight-week honeymoon touring Great Britain and mainland Europe. The Great Depression began in 1928, and by 1931 over 8 million Americans were unemployed – the unemployment rate was 16 percent. Times were hard, so in 1931 Grace Hopper was delighted to accept work as a mathematics assistant at Vassar College. She took a fresh approach to courses and incorporated ideas from other subjects such as chemistry. Her new approach was rewarded with a surge in the number of students taking math courses. I brought in new texts… and above all new applications. I began dumping in a little non-Euclidean geometry… all the Einstein stuff was brand new and exciting, and it was fun to try and bring it into the courses. Passionate about mathematics, Hopper submitted a thesis entitled The Irreducibility of Algebraic Equations to Yale and, age 27, got her Ph.D. in 1934. She continued working at Vassar, where a series of promotions carried her through the positions of instructor, assistant professor, and, in 1941, associate professor. Following Japan’s attack on Pearl Harbor in November 1941, Hopper tried to join the military. She was refused, because she was too light for her height, and anyway her job training mathematicians at Vassar was considered too important for her to abandon. Hopper was persistent about joining the military. In December 1943, Vassar College agreed to give her temporary leave. She joined the Naval Reserve after applying successfully for a waiver on her weight. She would later tell anyone in the military who was refused permission for anything to apply for a waiver – there were waivers for most things. She trained at the Women’s Midshipman School in Northampton, Massachusetts where, age 37, she lived four to a room with much younger recruits. Training was intentionally very demanding; recruits were expected to deal with harsh conditions and pressure situations. Hopper enjoyed the experience enormously. She achieved the highest training rank – battalion commander – and graduated first in her class in June 1944. 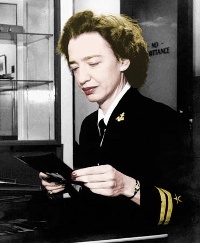 After graduation, Lieutenant Grace Hopper was assigned to Commander Howard Aiken’s Computation Laboratory at Harvard University, in Cambridge, Massachusetts, beginning July 2, 1944. Lt. Grace Hopper, age about 38, at Harvard University. Hopper quickly won the respect of Aiken and the other members of his team, who were working on the Harvard Mark I computer. The 51 feet (15.5 meters) long computer was Aiken’s brainchild and had been built by IBM. It was electromechanical, meaning it was powered by electricity and performed calculations using punch card instructions and moving mechanical parts. It utilized computing principles first worked out by Charles Babbage and Ada Lovelace in the 1800s. The Mark I could perform in a day calculations that had previously taken a month. It ran 24/7. Its operators, including Hopper, often slept beside the machine, repairing it when things went wrong. Hopper’s first major project was calculating gunnery tables needed by the Navy to aim their new guns accurately, taking account of conditions such as wind speed, weight of shell, and air density. Assembling gunnery tables involved a huge number of calculations – an ideal job for a computer. Hopper learned a lot at Harvard, developing her computer expertize to a level matched by few other people. In September 1947, a moth landed in one of the Mark II computer’s mechanical relays, causing the relay to fail. Someone removed the moth, so the computer was ‘debugged.’ The word already existed in computing, but Hopper and her colleagues thought it was hilarious that they were the first people to literally debug a computer. The moth behind the first literal debugging in computer science. When the war ended, Vassar College tried to tempt Hopper back, offering her a full professorship. She chose to stay at Harvard with the Naval Reserve, working in the new, intellectually stimulating, rapidly developing field of computing. In 1949, Hopper left the Navy to become Senior Mathematician at an exciting new company in Philadelphia. The company was the brainchild of J. Presper Eckert and John Mauchly, the wartime computer scientists who had built ENIAC, one of the world’s first electronic general-purpose computers. A snippet of assembly language. Computers needed instructions written in machine-code, which is even less easy for a human to read than the assembly language above. Hopper now envisioned a computer that could program itself. The computer would take instructions written in a human-friendly language and translate them into machine code. In computing science, such a translator is called a compiler. In 1952, Hopper and her team invented the world’s first compiler, the A-0 system. Hopper had chunks of machine code on magnetic tape: each chunk, called a subroutine, performed a different operation. She gave each of these subroutines a call number. In 1954, she was promoted to Director of Automatic Programming Development for the company, which by then had become Remington Rand. Hopper was determined to produce a computer language that relied on English words rather than mathematical symbols and could be used in business applications such as working out payrolls for large companies. She developed B-0. In her A-0 compiler, the A stood for arithmetic. The B now stood for business. Soon B-0 became FLOW-MATIC. Hopper and her team developed this new business computing language in the years 1955-1959. COMPARE PART-NUMBER (A) TO PART-NUMBER (B) ; IF GREATER GO TO OPERATION 13; IF EQUAL GO TO OPERATION 4; OTHERWISE GO TO OPERATION 2. READ-ITEM B; IF END OF DATA GO TO OPERATION 10. FLOW-MATIC allowed non-specialists to see what a program was actually doing, and made the language easier for new programmers to learn. In April 1959, computer scientists from government and industry got together and defined the needs of a new computing language to be known as COBOL (Common Business-Oriented Language). Grace Hopper was the committee’s technical consultant. COBOL, based on FLOW-MATIC and IBM’s COMTRAN language, became the dominant computer language for business in the 20th century. In the year 2000 about 240 billion of the 300 billion lines of computer code ever written had been written in COBOL. In 1967, the U.S. Navy requested Hopper rejoin the Reserve at the rank of Commander and work in the Pentagon in Arlington County, Virginia to sort out COBOL. Versions of COBOL from different computer companies had diverged so much that programs that ran on one computer could no longer run on others. This was totally contrary to the spirit of COBOL. Hopper was responsible for bringing together all the incompatible strands of COBOL to ensure the language remained true to itself. She did this by issuing a certifier – this was a program that tested any version of COBOL and then certified if it truly was compatible with all computers. She also took over responsibility for standards testing of computer components and systems. Today these roles are carried out by the National Institute of Standards and Technology. Hopper won a very large number of awards – too many to list here – including The Legion of Merit in 1973. 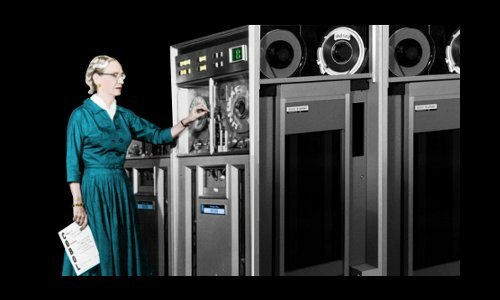 One award raises a smile: in 1969, the Data Processing Management Association instituted a new award, the Computer Science Man-of-the-Year award; its first winner was Grace Hopper. In 1991, she received America’s highest technology award, The National Medal of Technology, from President George Bush. Many of Hopper’s awards came in 1983 or later, particularly honorary doctorates. Until then, she had been largely unheard of outside computer science, but a lively appearance on CBS’s 60 minutes captured the nation’s imagination and made her famous overnight. One of the millions of viewers enchanted both by Hopper and her life story was Philip Crane, the Representative for Illinois. He initiated a successful bill in the House of Representatives promoting Hopper to the rank of Commodore. Grace Hopper, age 76, is promoted to Commodore at the White House in 1983. President Ronald Reagan looks on. Her rank was reassigned in 1985 to Rear Admiral. If it’s a good idea, go ahead and do it. It is much easier to apologize than it is to get permission. Life was not always easy for her. In 1949, shortly after becoming Senior Mathematician at J. Presper Eckert and John Mauchly’s computing company, Hopper was arrested in Philadelphia for drunk and disorderly conduct. After years of pushing herself hard for results, in the late 1940s and early 1950s she ended up pushing herself into depression, alcoholism, and suicide threats. She sought treatment for her alcoholism and made a full recovery. For decades, large numbers of young computer scientists passed through her teams, learning about programming from a master-programmer and master-teacher. Hopper also inspired large numbers of people at uplifting lectures she gave in later life about computing and her life as a computer scientist. As her father had predicted in 1910, Grace Hopper lived to see Halley’s Comet return in 1986. Coincidentally, 1986 was the year she finally retired, age 79, from the Navy, where she was known as “Amazing Grace.” She never fully retired from computing and worked as an industry consultant to the end of her life. Grace Hopper died in her sleep, age 85, of natural causes, on January 1, 1992 in Berkeley, California. Although she continued dating men after her divorce in 1945, she never remarried and had no children. She was buried with full military honors in Arlington National Cemetery, Virginia. In 1997, the Navy named a new guided-missile destroyer in her honor: USS Hopper. "Grace Hopper." Famous Scientists. famousscientists.org. 8 Dec. 2016. Web.